Just finished reading through the 2016 catalogue for MagSwitch, and thought others here might be interested in having a read. Some very cool things being done in the metal fabrication industry (in addition to where MagSwitch started, around woodworking). Came across a new source of hard-to-find tools, which although in its infancy, has already addressed a problem I’ve had for a long time. A number of years ago, I was sent a prototype of a new magnetic latch, from MagSwitch. It was a cupboard latch, and at the time they were still debating whether it should be an auto-latch or not – ie it can be switch off only temporarily, but would spring back to the on-state. That aspect didn’t eventuate, but the overall concept of a tiny MagSwitch did happen. Unfortunately, though, it wasn’t readily available in the Australian market. Well that is until now. And the MagLatch is all of $17, making it quite a bit cheaper than its larger cousins. The Woodkid only has a small niche range available so far, but I’m sure that will grow over time. The also stock the MagSwitch Universal Featherboard for $63, which is a great price. So finally, I can include the MagLatch into some of my projects again. And finally, an Australian invention is again available in Australia. 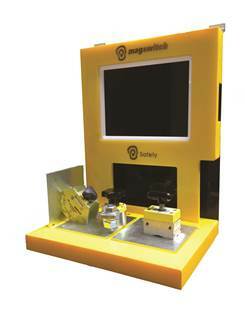 Retailers of MagSwitch will soon have a new Point of Sale device that looks quite well done. Nothing like being able to play with a product to see how well it works! They have also released their latest catalog which not only covers the product range, has some really interesting details about field depth, magnetic saturation, effects of airgaps (including painted surfaces etc). Worth a quick gander (here). I’ve suggested a new product to them – the MagSwitch GoPro mount. They probably won’t go with it, but when my 3D printer arrives, I’ll make one anyway! The range of MagSwitch products seems to grow and grow, and rightly so, the industrial sector are the main benefactors. 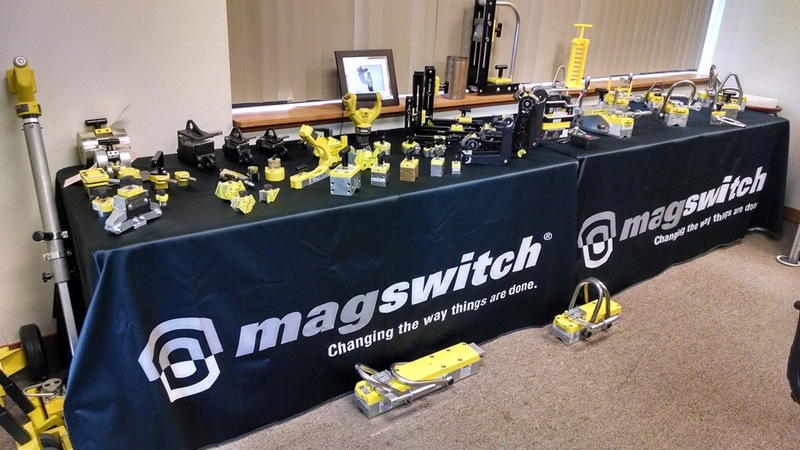 However, I miss the innovative products MagSwitch was bringing out for woodworkers and workshop owners, each one being such a game-changer. I know the products are still available, but as there has been nothing new for us for so long, they just become part of the background view when you walk into a store. I still look longingly at the display, hoping to see something new. I still love the products, and use them very regularly, I used to do the occasional woodworking show demonstration for them when they were still an Australian product. Just reminiscing about the days when MagSwitch and woodworkers were so much closer. As a distraction, I dropped into Hare & Forbes which was just around the corner. 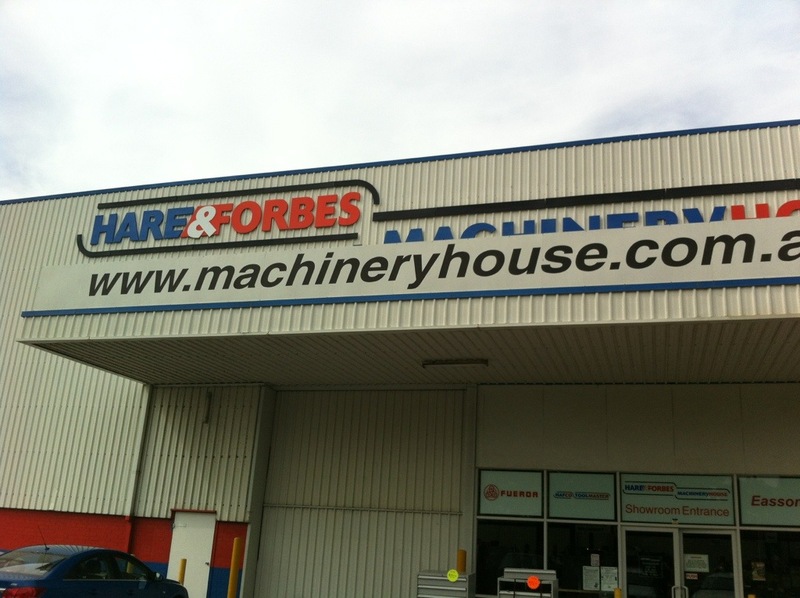 A massive collection of machines – very impressive. 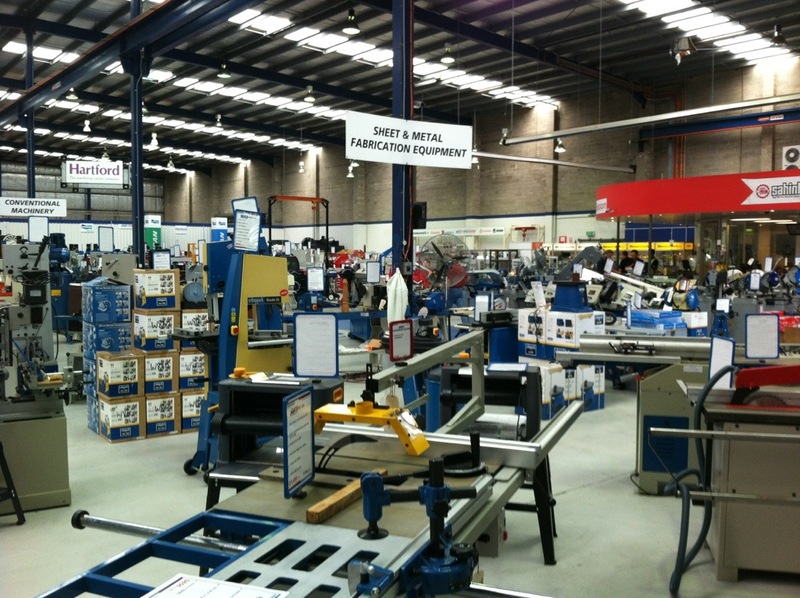 Woodwork & metalwork machines. Some awesome industry-sized machines. Drool. Found one thing that I am very keen to have in the shed. 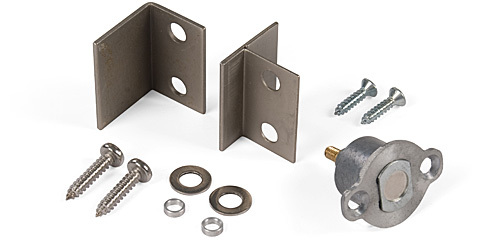 I was looking at how to fit in an I beam for a chain hoist, but that doesn’t have a lot of versatility (being linear only). 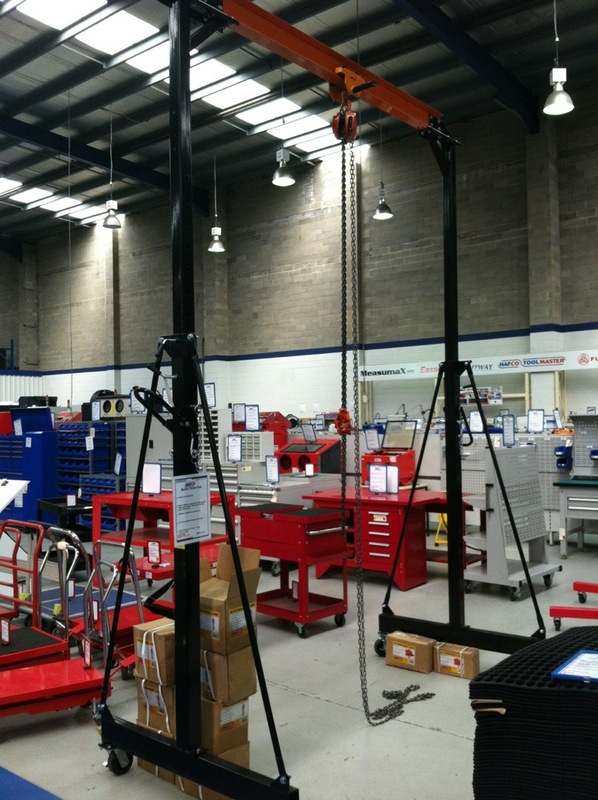 This stand can lift and move along an I beam, and is wheeled to boot, so you can position the hoist where you need it. It looks awesome, and a real back-saver. I have the chain hoist already, so along with this mobile rail, I only need the carriage. Would be great if I had one of the MLAY 1000×3 from MagSwitch – that would really cap the whole combination off! Don’t even know if these are in Australia! 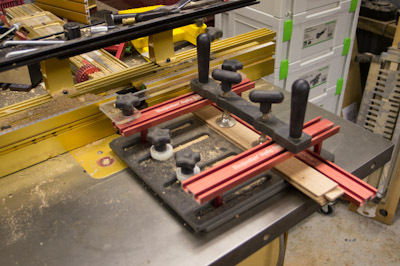 Very cool though – imagine swinging my tablesaw around the workshop! 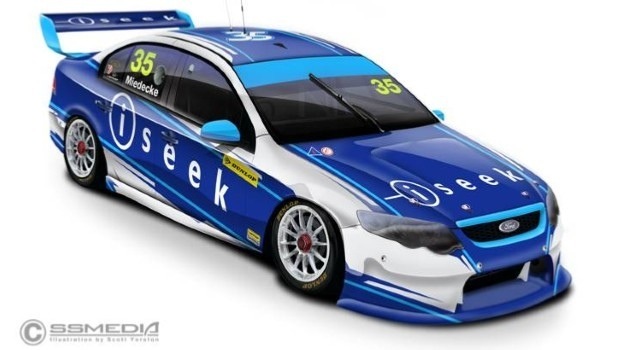 With the 2013 series of the V8 Championship about to get underway, and in a new format with multiple manufacturers finally able to participate once again, the development series is also kicking off. 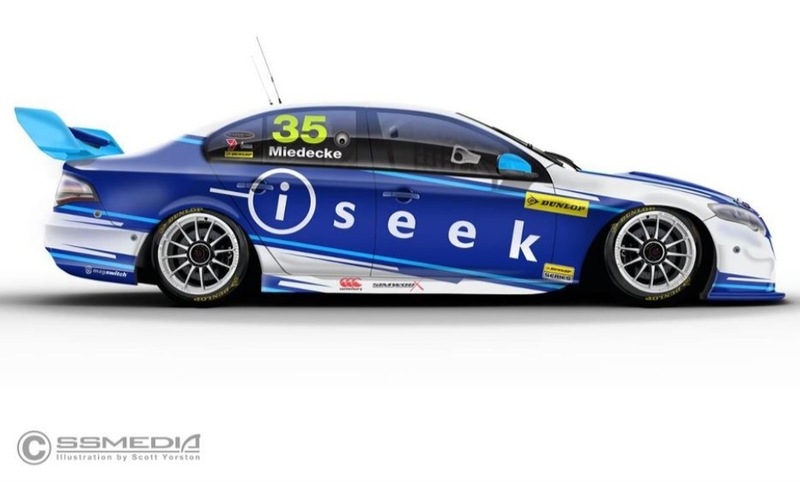 On car #35 in the Dunlop (development) Series, driven by George Miedecke, MagSwitch has made a reappearance down under by becoming one of the car’s minor sponsors. Their logo can be seen just behind the rear wheel. Welcome back MagSwitch, we missed you! Time to come full circle and appear at the woodshows, and/or bring out more innovative products. We’ve liked all the ones in the past, and there is still plenty of scope for further developments for woodworking products. (Still haven’t seen my MagBroom!) I know MagSwitch is still available in Carbatec (among others), but a limited range, and I don’t think it has been actively promoted since the last time I was demo’ing it at the woodshow. There have been some new products, mainly for industrial products. There is a larger MagJig now, and MagLatches (I got a very early version of it a few years back) are now available, just not down under. Still want an I beam in the new shed, with a chain hoist, and I’d love to have an MLAY lifting magnet to attach. Not sure what I’d lift with it, just cool to have! Being able to swing the tablesaw around the workshop perhaps! Taking the first components off to the next stage of the process involves the router table, and the rail & stile plus raised panel bits. 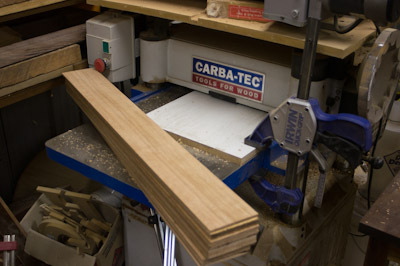 After some test cuts, the router table was set up to run the rails and stiles through the first router bit. 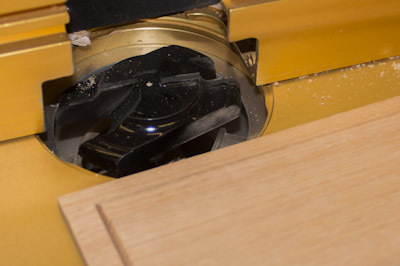 I use MagSwitch featherboards to hold the timber against the router table fence. They are so easy to position, and hold fast to the cast iron top of my router table. Make you think it fortunate my router table is cast iron, but it came about in the reverse order. I made the router table out of cast iron so that I could use MagSwitches on it. After changing to the complementary router bit, it was time to cut the end grain of the rails. If you ever wonder how to remember which is which, think about rails being horizontal. They certainly are for trains! The stile is the other one. The Woodpeckers Coping Sled is awesome for this task. It holds the rails perfectly, and perpendicular to the direction of travel. If I had taken more care, I would have used a sacrificial backing. 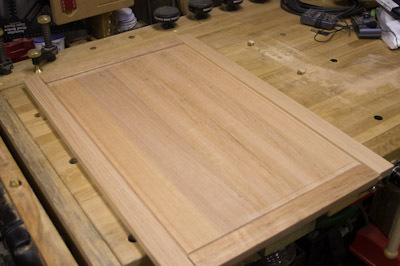 Probably should have – hardwood tears out a bit too easily. I’ll make sure I do when cutting the doors for the sink unit. 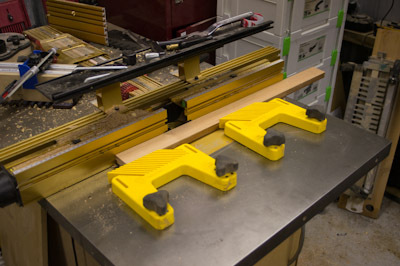 I just checked – the coping sled is still available from Professional Woodworkers Supplies. They now have a mini one as well, but given the full sized one is on special, I’d still go with that one (the one pictured above). There is so much more with this one, it is worth the difference. 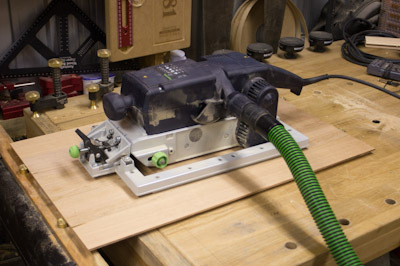 After removing the panels being glued up in the Frontline clamps, I used the Festool belt sander to do a final flattening (including removing any glue squeezeout). The large sander weights 7kg, and when coupled with the sled means you can hold the handle, and, well, hang on – letting the tool do all the work. The work is clamped up using brass dogs on the vice, and dogs in holes in the table. 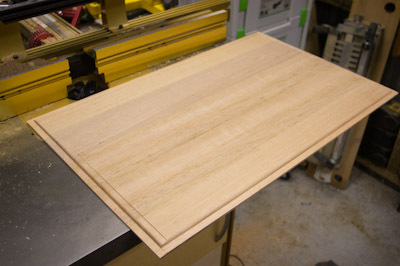 Once sanded (not the final sand – more a sizing sand than a finishing one), it was back to the router table, this time with a raised panel bit. I don’t have a raised panel bit with a cutter for the back yet, so have to adjust it manually. This is not the final pass, but an intermediate one to check fit. Best to do the crossgrain first, then the longgrain. This is a monster bit – pretty much at the limit that a router can (or rather should) drive. The run at the slowest speed still gets a decent tip speed. A quick test fit showed I was close, but still needs another pass to get it there. Looking good though. Will look even better when I do the 3D routing into each panel! Once that routing is done (next session), then I can glue the panels up. One thing I have been surprised with so far, is the lack of waste. I’d always try to use timber to maximise yield, but there is always waste. So far I’d not have enough offcuts to fill a 10L bucket – the yield is exceptional. Even these thin panels that were ripped off the 19-20mm thick boards. They will be perfect for the back of the units. I wanted to run them through the thicknesser, but it just doesn’t go thin enough. To solve that problem, I clamped on a sled. The boards would not feed initially, but with a quick rubdown with Sibergleit, the boards fed through smoothly and easily. I wouldn’t do this with any timber, or to go too thin, but it will get you out of trouble. So a good session. Progress seems slow, but this is always the slow part of any project. Once the items are cut, and some preliminary joinery done, it usually flies together. Some good news and bad news. The good news is that I am documenting sessions on video. Bad news is I am not planning on releasing the video until the project is complete!